Whew! Finally back from Phoenix! Ronnie and I had a great time! This will be a quick post as I really need to answer calls, do laundry, fill orders, etc. More to come about the trip. But, I had to share this funny photo. Across the street from the hotel where we stayed is an office building with rows of covered parking spaces. 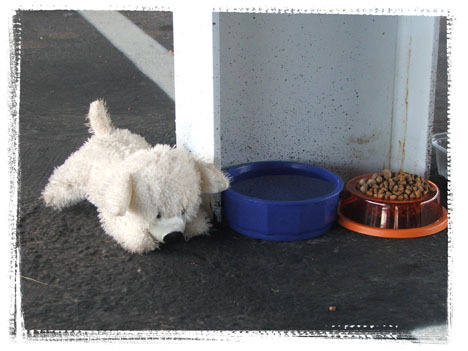 One day as I was walking through the parking lot I noticed this stuffed puppy next to a bowl of water and a bowl of dog food. I thought this was really weird! The dog and his food and water were there all week!